I ended last month by giving a shout-out to basketballers Nate Robinson, Nate "Tiny" Archibald and Steve Nash on Nate and Nash are GREAT! Who was Steve Nash cheering for at the World Cup? You'll see when you click below. Today's post dedicated to voice talent Eddie Eagle - a huge Chicago Blackhawks fan! In the sports world, Canadian power is more prevalent in the hockey realm than on the baseball diamond or soccer pitch. We didn't even qualify for the World Cup going on right now in South Africa but Toronto-born Joey Votto of the Cincinnati Reds hit his 16th home run today! The Toronto Blue Jays have actually hit more home runs than any other baseball team this season though: 115 compared to Boston's 103. The Buffalo Sabres went crazy for Canada at this weekend's NHL Draft! 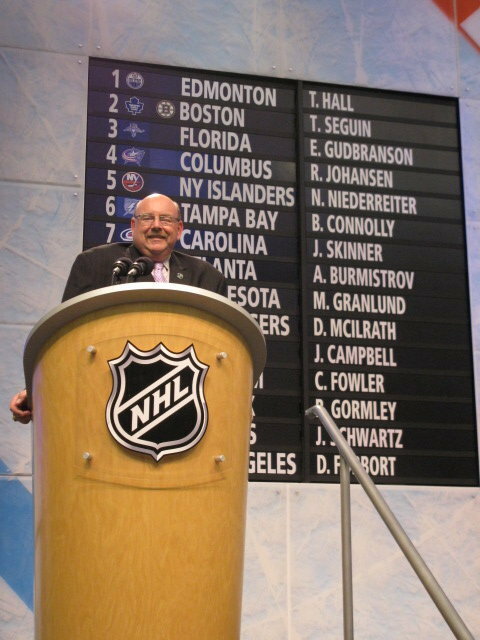 Three of the team's top four picks were from the Western Hockey League while eight of their nine overall draft picks were from north of the border. Congratulations also to the NHL Rookie of the Year from Buffalo: Tyler Myers! The first three names (Taylor Hall, Tyler Seguin and Eric Gudbranson) all played in the Ontario Hockey League while the next three players (Ryan Johansen, Nino Niederreiter and Brett Connolly) all played in the Western Hockey League. Here is A look at the Entry Draft by the numbers. Talk about another catch-22 situation (like I did last week): 22 Americans (including Canadian-born dual citizen Cam Fowler, who plays for Team USA) were selected in the first two rounds of the draft. They were born in 11 states, and 11 Americans were taken in each of the first two rounds. "Ladies and Gentlemen, good evening and welcome to Staples Center/Angel Stadium..."
"Nothing is impossible... until you try it yourself. Then, have Google handy." New Feature: Friday Facebook FUN! Twitter updates from Karen for the week preceeding Mon Jun 21, 2010. They both provide quick links to articles, interviews and videos. Cool! Social Media...by voice actors, for voice actors. Lots to explore and build your voice over business! So, NO Twitter updates from me. But how about Friday Facebook FUN? Sunday's Facebook status (June 20): Tennis with my wife starts this Father's Day followed by a Tim Horton's breakie with my 3 terrific teens. We'll all be meeting at my parents later for a BBQ...THANKS for everything Dad!! Only time will tell if yours truly has started a new social media trend known as Friday Facebook FUN...THANKS for stopping by! It's June 22nd and 22 Canadian cities (including Kelowna, BC!) have been added to the new Canadian Monopoly game. We made the list just like Vancouver, Ottawa and Montreal. The new Monopoly edition will also include Canadian cultural events and scenarios for players - like skating on the Rideau Canal in Ottawa. On a traditional Monopoly board, Kelowna will occupy the square normally held by Virginia Avenue. You can pick the new Monopoly up on June 28th. 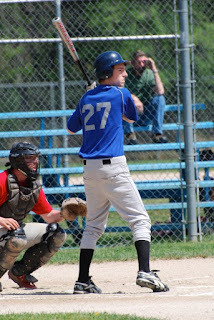 Justin is playing summer ball (Midget AA) and I am predicting a provincial title in early August for Rutland! A great #27 retired today in the NHL: Scott Niedermayer. He led the Cranbrook (another cool place in beautiful British Columbia!) AAA Midgets with 55 goals and 92 points in 1989. He had 14 goals and 69 points as a rookie with the 1989-90 Kamloops Blazers to help them into the Memorial Cup. Great Scott is the only hockey player in the world to win the Stanley Cup (4 in fact! ), Olympic gold, the World Championship, World Junior Championship, the World Cup and the Memorial Cup. Scott Niedermayer is a shoo-in for the Hall of Fame! prolific voiceover blogger Stephanie Ciccarelli BUT mentions two ladies (Angela James and Cammi Granato) who will be the first to go into the Hockey Hall of Fame on November 8 along with Dino Ciccarelli. Stephanie will be a guest blogger here in the next few days. You don't want to miss her article! 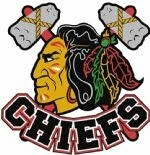 Chicago won the Stanley Cup in overtime this past Wednesday! Congrats to Buffalo boy, Patrick Kane, for scoring in overtime! The goal was assisted by former Buffalo Sabre, Brian Campbell. There is a new hockey team coming to Kelowna and you have to love their logo! I will be doing the Public Address announcing for the team. If you would like to be involved with the team in one way or another, please visit the Kelowna Chiefs website. - a popular Mexican restaurant chain from 1975 to 2004 co-founded by former Green Bay Packers player Max McGee. - the golfer: Chi Chi Rodriguez. He was robbed inside his home in Puerto Rico last month. "I'm getting so old, I don't even buy green bananas anymore." For those of you that love the NHL's "History Will Be Made" ad campaign, you can snag the music here. Here is the channel with 47 commercials and counting. RIP John Wooden. "Make each day a masterpiece. Help others." Yesterday, arguably the greatest coach of all-time in ANY sport died. Accept people. Don't expect things from people. Coach John Wooden's website is filled with encouragement. Pay a visit when you get a chance. I wonder if Kevin Garnett and the Boston Celtics will knock out Kobe Bryant and the LA Lakers in the NBA finals starting tonight? I am hoping they do! Both those legends started their careers right out of high school. Garnett graduated in Chicago while Bryant graduated a year later in 1996 in Philadelphia. Is it just a coincidence that those cities are currently battling for the Stanley Cup in the NHL? Growing up in South Carolina, Kevin Garnett was a fan of the Los Angeles Lakers and lists former Laker Magic Johnson and Dallas Cowboy Tony Dorsett as his sports heroes. Kobe's parents named him after a type of steak (kobe) seen on a restaurant menu prior to his birth. "Jelly Bean" was his dad's nickname. Joe Bryant averaged 8.7 points per game in 606 career games in the NBA. Kevin Garnett's favorite foods are hamburgers, french fries and pizza.